Lindsay Boyers is a holistic nutritionist with a Bachelor's degree in food and nutrition and a certificate in holistic nutrition consulting. She has a background in functional nutrition and 8 published books, including The Everything Guide to Gut Health, The Everything Guide to the Ketogenic Diet, and The Everything Guide to Intermittent Fasting. Fluid regularly enters your body tissues from your blood. Normally, excess fluid is excreted from your body, so you don’t even realize it’s there. In some cases, however, fluid isn’t removed correctly from your tissues and causes water retention, medically referred to as edema. Edema has a number of causes, many of which are not serious, but in some cases, edema may indicate an underlying health problem. If you have a clean bill of health from your doctor but you’re still experiencing edema, try reducing water retention naturally. Your kidneys are responsible for balancing the amount of sodium and water in your body. When your sodium levels are high, your kidneys hold onto excess water in an attempt to dilute the sodium. If you regularly eat too much salt, this can lead to water retention and even high blood pressure. Cut back on your sodium intake. Eliminate processed foods, canned foods and frozen foods. Use fresh herbs and sodium-free spices for cooking instead of salt. Stay away from cured and processed meats, which are often high in sodium. Your sodium intake should be less than 1,500 milligrams per day. It may seem counterintuitive, but an effective way to reduce water retention is to drink more water, especially if your diet is high in sodium. When you are well hydrated, your body is less likely to hold onto excess water in an attempt to maintain sodium balance. Aim to drink half your weight in ounces each day. If you’re 150 pounds, this means drinking 75 ounces, or just over 9 cups, of water per day. Avoid dehydrating beverages such as tea, coffee and alcohol, which can make fluid retention worse. Coconut water is high in potassium -- an electrolyte that helps flush sodium out of the body. Coconut water can help reduce water retention and fight bloat. Choose varieties that don’t contain any added sugar or artificial ingredients. Drink coconut water in addition to plain water, not in place of it. Dandelion is often thought as nothing more than a weed; but the perennial is not only full of nutrients like vitamin A, vitamin C, iron and potassium, it can act as a natural diuretic to reduce water retention. A study published in the “Journal of Alternative and Complementary Medicine” in 2008 established that participants who ingested dandelion extract experienced an increase in urination frequency in the five-hour period after the dose. Although dandelion is a natural herb, it isn’t safe for everyone. Don’t take dandelion if you have kidney or gallbladder problems. Talk to your doctor about the safety of taking dandelion, especially if you’re on medication. Columbia Health: Go Ask Alice: Bloating or Water Retention? Can You Remove Facial Hair With Salt? 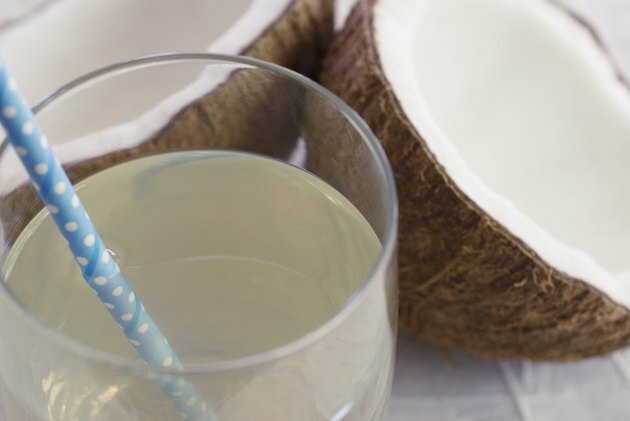 Does Drinking Coconut Water Cause Diarrhea?